If ever a Renaissance Man existed, it was Friedrich Wilhelm Heinrich Alexander von Humboldt. Born in Prussia on September 14, 1769, he was an explorer, naturalist, geographer, and a leading proponent of Romantic philosophy. His five-year exploration of Latin America—the first to describe it in modern scientific terms—resulted an expansive set of descriptive books which took more than two decades to write and publish. His far-reaching contributions included the proposal that continents, especially South America and Africa, were once joined. Fully appreciated in his lifetime, the entire civilized world went into mourning when Humboldt died on May 6, 1859. Cities rushed to memorialize the brilliant man who had changed the way the world and nature was viewed. New York City was on the forefront. As the centennial of Humboldt’s birth neared, a group of influential New Yorkers formed the Humboldt Monument Association. When they announced that the German sculptor Gustav Blaeser has been “entrusted with the order” on April 27, 1869, the date of the centennial, September 14, was terrifyingly soon. To make things worse, three months later the committee was still arguing about the form of the memorial. 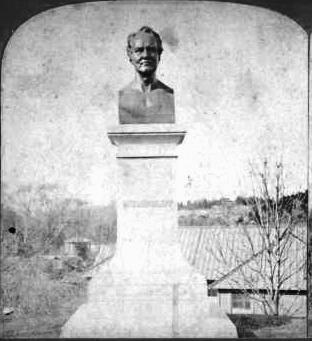 Although Blaeser was already at work on what committee members described as “a bust, to be of bronze, four feet in height,” Carl Schultz insisted at a meeting on June 15 “that a statue to cost about $10,000 would be more appropriate than a bust,” according to The New York Times. Schultz was voted down, however, and the sculptor forged on with the original project. His design called for the massive bust to perch on a 12-foot granite pedestal. The committee’s choice of Blaeser was a wise one. He had been close friends with Humboldt and was, according to The Times, “one of the most prominent sculptors of Germany.” Blaeser worked not only from memory, but from the Humboldt’s only death mask, which he possessed. 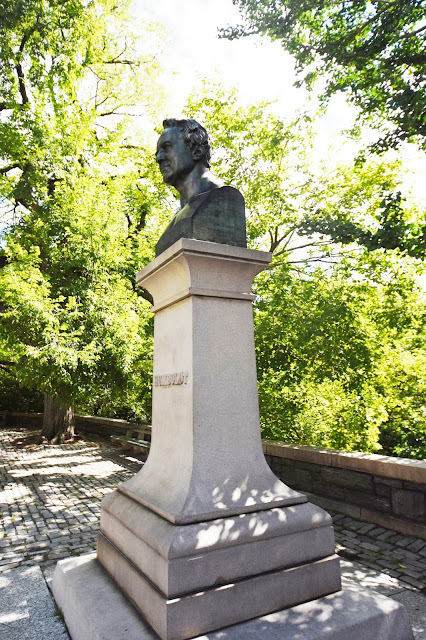 And sure enough, on September 14, the monumental-sized bust was in place at the most prominent entrance to Central Park, at Fifth Avenue and 59th Street. The location was chosen not only because it was the most used entrance; but because it was known as The Scholars’ Gate—an appropriate nod to the thinker. The Humboldt ceremonies lasted all day, including a parade, a banquet and a torchlight procession. But the main attraction was, of course, the unveiling of the Humboldt bust. A German chorus (described by the Herald as a “sturdy mass of Teutons in front, animated with joy at being able to celebrate on free American soil the birthday of their greatest of modern scientists, and ready to burst forth in full chorus”), and full orchestra contributed to the ceremony. After exhaustive speeches, the cords were pulled and the bust unveiled. “Cheer after cheer went up from the lips of all assembled, even the ladies present joining heartily in the chorus, and the orchestra struck up, bearing the cheers with increased volume to the furthest confines of the immense assemblage,” reported the New York Herald. The magazine also found the 59th Street and Fifth Avenue site fitting because of its proximity to the Central Park Armory, proposed as the site of the new Museum of Natural History. The director of the newly-formed museum was a follower, it noted, of Alexander von Humboldt. An early stereo card shows the monument in a still decidedly rural setting. The international fervor over Humboldt’s centennial eventually died down. And as the decades passed, the public’s familiarity with the brilliant scientist and thinker dulled. 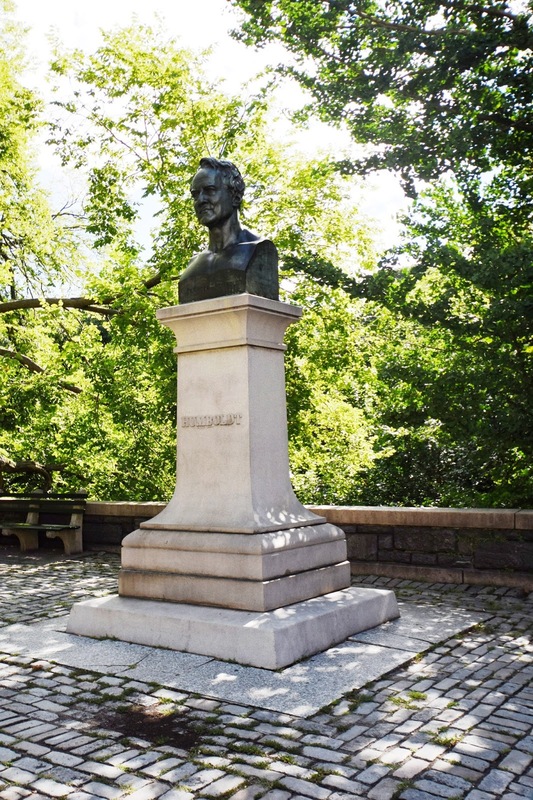 By the time the huge bust was moved to (appropriately) the Naturalists’ Gate directly across from the American Museum of Natural History, most people had no idea who Alexander von Humboldt was. 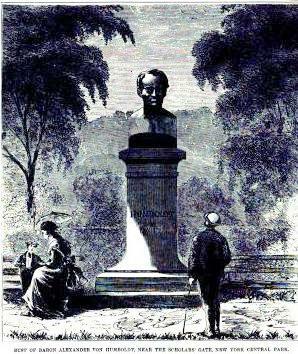 In 1993 the Central Park Conservancy conserved the 124-year old monument. Today the massive bust stares across Central Park West toward the Museum, essentially ignored by the throngs of tourists and New Yorkers rushing past. The Little 1854 House at No. 639-1/2 Hudson St.